Don't Miss This Deal! Check back every day for a new surprise deal! Missed out on this deal? Click here for more options. Advance Guard2 for dogs is a once-a-month topical treatment for fleas, flea eggs, and flea larvae. It can be used on dogs and puppies 7 weeks of age and older. Sorry! We couldn't find any matching results. Advance Guard 11,waiting to see if it keeps my dog flea and tick free. This is the first time I've used this product, so I have no idea whether it will work or not.My impression of this product comes entirely from my dog. I have 2 Border Collie / Aussie mix dogs - One is 15 and One is 1 (the one year old i just rescued from a place near me)! Both medium - high energy dogs and they go with me when i am out trail riding with my horse. I need affordable pet supplies! I am very pleased with the Advance Gurard2 flea and tick spot on! Also with very pleased with 1800PetSupplies!! Tobi & Tucker - One is 15 years old and One is 1 year old! 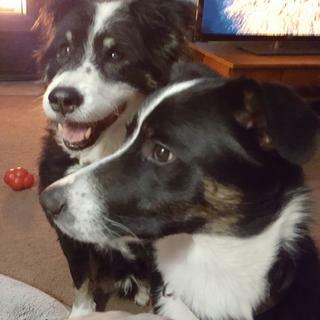 I have 2 large dogs - Both Border Collie / Aussie mix - they love to run and are outside playing and walking in the woods with me! I am thrilled to find an affordable flea/tick medicine for them! BEST ANSWER: Yes, the waterproof formula works through contact to kill the fleas, flea eggs & flea larvae.